LaTeXiT is compatible with the most popular versions of Mac OS X. From Mac OS 10.4 (10.6 starting from version 2.12.0) to Mac OS 10.14, it can be deployed on almost any machine, even the “old” machines in laboratories that will still be used for years. This is not a sacrifice, the LaTeXiT code is optimized : most recent APIs are used if available, and old ones are used if not. The generated equations are in PDF by default. Obviously, they can be converted into images, but LaTeXiT provides more advanced exports, like MathML1 or SVG2. As much as possible3, LaTeXiT embeds the LaTeX code inside the generated equations, so that they can be reopened, for further modifications in LaTeXiT. Not to mention LinkBack !. 3 : See the FAQ for limitations when the export is not PDF. To simplify the writing of equations, LaTeXiT features syntax coloring, a dictionary, a smart error manager relying on log analysis of the underlying LaTeX engine. You can also create your own keyboard shortcuts, document templates… everything is made to help you customize your environment and save time. When working on a document, the same equations are often needed again and again, with slight variations. An erroneous equation might also need a correction. With LaTeXiT, your equations are automatically saved in a history, standard or smart1. And since the history is not enough, you can manage your own libraries of equations. Your work will always be within reach, and you will be able to share it with others ! 1 : records only equations effectively used. LaTeX is wide, very wide. Even an expert needs reminder ; a beginner really needs guidance. To help using the most common symbols, LaTeXiT provides a bunch of standard palettes. And obviously, you can create your own and distribute them as plugins. LaTeXiT does not embed a LaTeX engine, it relies on those you installed yourself. Is it less handy ? That choice makes LaTeXiT a lightweight tool, without fences. Even better, you can use custom scripts during the latexisation for some advanced goals. You can find a beautiful example related to Feynman diagrams, that requires several latexizations, that LaTeXiT can manage very easily. A good application can communicate with others. On that point, LaTeXiT rocks again ! Though the Services menu of Mac OS, LaTeXiT can detect and transform equations from any other application1. And of course the transformation is reversible2. 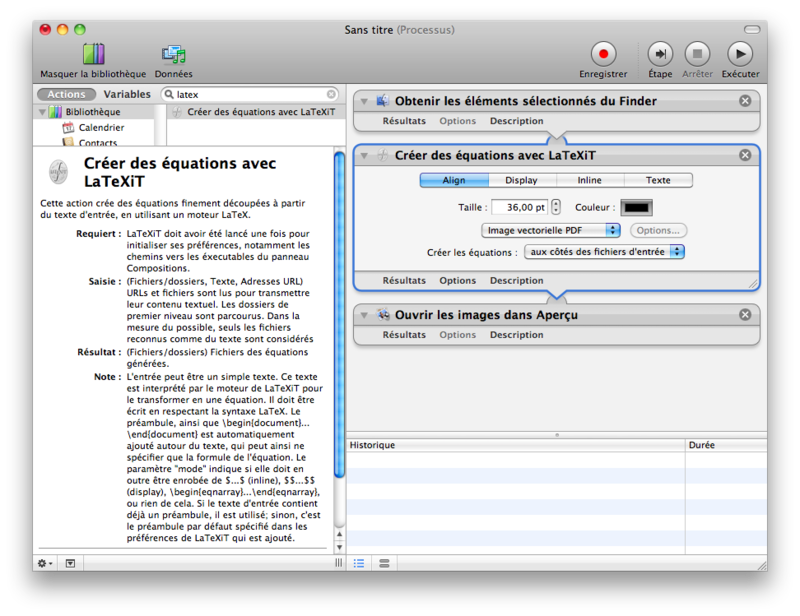 Moreover, for a set of equations to convert in batch, the solution is obvious : Automator ! 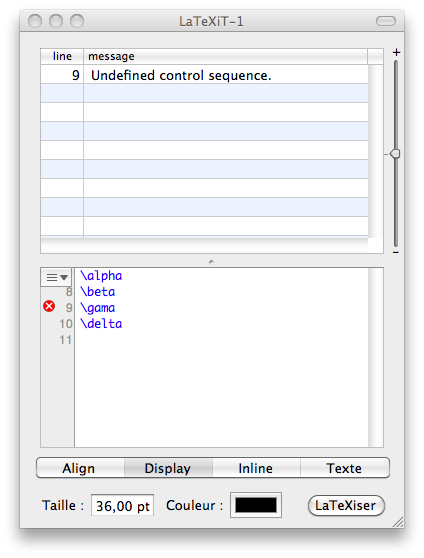 LaTeXiT is fully compatible with this underappreciated component of Mac OS X. 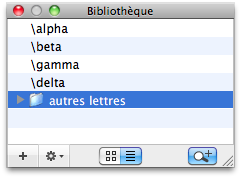 1 : only if it allows replacing text by an image ; for instance, Keynote does not. 2 : the target application must not modify the data provided by LaTeXiT. Unless you are a developer, there are few chances for you to know what LinkBack is. Without extra work, the equation is updated inside the target application. Yes, if only Linkback was better known and spread, that would be marvellous. Core Data is a data-management library developed by Apple. Why am I telling you that ? Simply because LaTeXiT is using it, and that is a good thing. More than performance, Core Data offers interoperability. LaTeXiT is OpenSource, and its data model is public. Other softwares can therefore be compatible with LaTeXiT's history and library. It's up to you to imagine what it could be useful for ! Be kept informed of updates ; LaTeXiT is using the Sparkle component, a secured and reliable one. The updates are… like they should always be. LaTeXiT is open source ; the code is available for free under the CeCILL license. Customize it and improve it as you need it ! I confess that I do not speak Japanese myself. Thanks to the work a few volunteers, LaTeXiT has been localized for many countries. The structure of the software makes it very easy to add new languages ; do not hesitate to propose a new one !